Trouble on Beryl Isle has just been released! Produced within Georgia Tech’s game development club VGDev, and led by project lead Sean Flanagan, this visually striking game is a 3D open-world platformer with an emphasis on discovery and parkour. For me, this was a milestone in my journey to become a professional game developer. Unlike previous projects, this is the first game I worked on where I wasn’t programming lead and had to adapt to another’s code base. In addition, although I’ve been programming games for 7 years, I recently transitioned from 2D to 3D game development. This was my first project in Unity. When I started, I didn’t even know what MonoBehaviour was. I’ll admit I was a bit intimidated. What could I contribute? The first few weeks, I simply observed how the other contributors worked and attended workshops to learn the basics of Unity. Eventually I noticed that progress on world development was slow and decided to fill that niche. Using the procedural polygon tool in the codebase, prototyping levels was easier than expected. Every week for the next few weeks, I contributed a chunk of world design to incorporate into the city. A sector of the city I designed in the published version. Note I did not create the environment art. Although level design was going well, my goal was to be a gameplay programmer, so I decided to pitch an NPC enemy for the game. 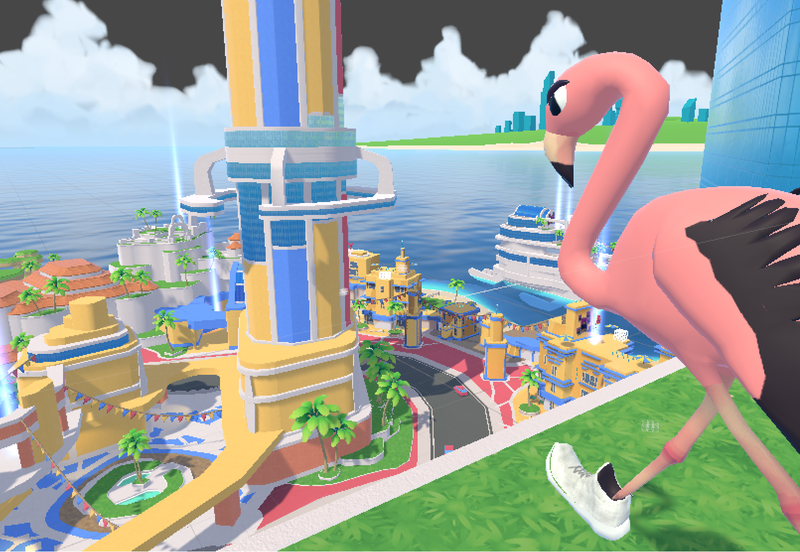 I decided on a flamingo, and to fit in better with the theme of the game, I outfitted him with some kicking white sneakers. In the following month, I took Gerald from concept to reality, learning how to model, texture, rig, animate, and program enemy AI in Unity. I’m really happy with how it came out. In the video below, note how Gerald circles the player before attacking and his head turns to follow the player. A showcase of Gerald. The AI architecture is a Finite State Machine with states: Wander, Kick, Prepare Kick, Circle, and Death. Download the game at the game development club’s website. It will be worth it. This fall I am looking forward to lead a game of my own in VGDev. Stay tuned.